Going away to college can mean major lifestyle changes for students who are living away from home for the first time. Dormitory living can make the transition easier, combining the opportunity for freedom and fun with reassuring comfort and security. Residence life at Silliman University provides a balance between the educational and social needs of students, such as lectures and discussions, athletics, spiritual, social and cultural programs, and other experiences. Silliman University operates regular and cooperative dormitories. These dormitories provide comfortable living conditions for approximately 700 students. There are three regular dormitories for women and two for men. These dormitories are directly supervised by dorm managers who are full-time staff of the University. Two identified regular dormitories provide accommodation for high school students: Davao Cottage for girls and Doltz Hall for boys. There are two cooperative dormitories for women and three cooperative dormitories for men on the main campus. Cooperative dormitories have advisers who are either University staff or selected graduate students. The residents undertake housekeeping and the planning of the food. The adviser is authorized to collect the board money, which is payable two months in advance, and other incidental fees approved by SHRD and SPS. Lodging is paid direct to the Business and Finance Office. Occidental Hall – a guest dorm that accommodates semi transients for foreign students on short term special courses as well as alumni, friends and parents. 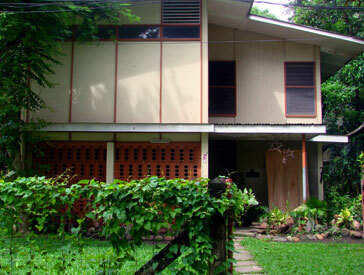 Davao Cottage – Dorm for high school girls. Meals for Cooperative Dormitories– Payments are accepted upon entrance to the dormitory. Freshmen and sophomore students who are not from the city are given priority in accommodation. Limited accommodation slots are available for juniors and seniors. Admission is based primarily on good behavior with the final approval by the SHRD office. Reservation for vacancies must be made prior to enrollment. Submit a fully accomplished application form to the SHRD. Be personally interviewed by the SHRD head and/or his/her representative. Make the necessary down payment equivalent to 1/4 of the total semestral board and lodging fees and a processing fee of one hundred pesos (P100.00) at the Business and Finance. Present the official receipt of payment to SHRD. Advisory: For room assignment, residents are encouraged to see or call the dormitory manager on or before the enrollment period. No student should come to Silliman University expecting reserved space in the dormitory unless he has gone through the process indicated above. Student resident counselors are upper-class residents designated as Big Brods and Big Sisters in their dormitories who assist students, especially freshmen and new students. They are selected for their familiarity with campus and dormitory life, leadership experience, training, good academic performance and general desire to help students. Their responsibilities include helping freshmen with personal and academic problems, and other concerns that need action from the dormitory administration. Each dormitory is encouraged to elect officers in order to deliberate, decide and effect activities to enrich living experiences. The governing body for each dorm varies, but generally consists of a president, vice president, secretary, treasurer, social chairperson, and religious life chairperson. Dorm meetings, scheduled regularly throughout the school year, give residents a chance to become acquainted with one another, plan activities, discuss problems, and become acquainted with dormitory and campus activities. All inquiries regarding dormitory service should be addressed to the Student Housing and Residence Division, Office of Student Personnel Services, at the Ground Floor, Hibbard Hall. 50 % of the payments for withdrawal after four weeks of the opening of classes up to midterm period. 100 % of the total fees for withdrawal after midterm period. In summer school, 50 % of the payments will be charged for withdrawal within the first three days of classes, 100 % of the payments shall be charged after this period. A student withdrawing his/her dormitory space by reason of sickness or physical injury must submit a medical certificate and a clearance endorsed by the dormitory adviser/manager and head of the SHRD and approved by the Dean of Students. For withdrawal of enrolment, a copy of the leave of absence endorsed by the dean or principal and approved by the Vice-President for Academic Affairs must be submitted to the Office of the Student Affairs. The Office of Student Affairs shall not endorse the University Clearance Form of the student if the charges are not fully paid.